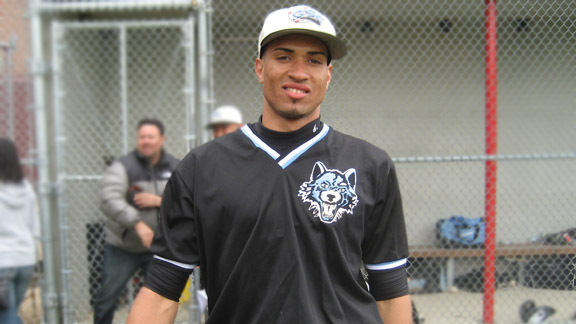 Williams Jerez with a .695 regular season batting average, .758 OBP and 32 RBI's, is considered the Big Apple's best prospect. When the Grand Street Campus baseball team’s season ended early Saturday night, all of Williams Jerez’s teammates made sure to have him sign a baseball for them because most of them feel like he’s going to be a star one day. With the draft beginning Monday at 7 p.m., all eyes are on the Brooklyn player, who scouts agree is the best prospect coming out of New York City and maybe even the entire state. ESPN’s Keith Law ranks Jerez 97th in his top 100 prospects list and Baseball America has Jerez ranked as the 53rd prospect in the country. Some scouts, while they love his potential, see him as more of a fifth-round type because of his raw ability and the talent level he faced in New York City. No matter when Jerez will be picked, he is just excited to be in his situation. “I think I've been in touch with every team in the league and it feels great knowing that many teams are looking at me,” Jerez said through a translator. It wasn’t that long that teams weren’t looking at Jerez, who came to the United States from the Dominican Republic just two years ago at the age of 17. That’s a year older than exceptional kids from the Dominican have already signed professional contracts. One scout said that he wasn’t surprised that Jerez didn’t get as much attention then as he has now as he feels Jerez has really only blossomed over the past year. Jerez has true five-tool potential. He is quick on his feet, making him strong on both the base paths and in the outfield, he has a strong arm, and he can hit for both average and power. But what the scouts collectively rave about is how he projects, as he’s just 6-4 and 190 pounds. That room for growth has led to all sorts of ideas of his potential, with some even seeing him developing into a player similar to current Mets right fielder Carlos Beltran. “Because of his body type and he’s got some nice loft to his swing, I think that he could very well become a strictly left handed version of him,” a scout said. One problem Jerez is facing is the question of his age. Documents he has produced for scouts have him born on May 16, 1992, but the issue has been raised if he is truly 19. His high school coach, Melvin Martinez, said those questions are a load of bull and it always seems to happen with talented players from the Dominican Republic. Scouts say it is a concern, but one that doesn’t seem to be taken too seriously. Jerez said that a lot of the claims that he is overage stem from opposing New York City teams trying to distract to get an edge on his tough Grand St. team.